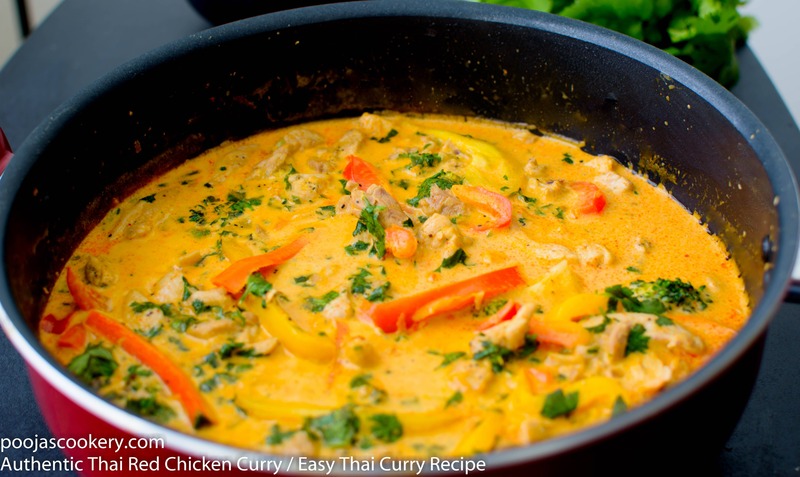 If you are a Thai food lover, you must try out this Thai Red Chicken Curry. Very simple to prepare and Thai paste gives it authentic taste. Thai curry is an authentic Thai cuisine which is prepared with different types of curry pastes. Thai red curry or green Thai Curry get their name from the color of the curry paste used in preparing. Other then these two curries , there are other kinds of Thai curries too. like Jungle curry, Massamam, Panang Curry ,Thai Red Chicken Curry etc. Earlier, I had prepared Thai Green curry and today, let’s see how to make Thai Red Curry . Wash and cut Chicken breasts into thin strips. Keep them aside. In a bowl, combine Red Curry paste and fish sauce into coconut milk . Stir well and make sure that there are no lumps. Heat a pan on medium high heat. Add oil and fry chicken pieces along with some black pepper for about 5-6 minutes or until it is tender. Remove on a plate along with all the liquid released by chicken. Use the same pan. Wipe it with paper towel. Add a tablespoon of oil and Saute grated ginger and garlic for a minute. Add Onions and saute till onions become translucent. Add Brocolli and saute for a minute. Now add carrots and thinly sliced red and yellow bell pepper. Mix well and cook the vegetables covered for 2-3 minutes. Remove the cover and add cooked chicken. Mix well . Cover and cook for 2 minutes . Now add in the prepared Thai gravy into this. Keep the heat to low and let it simmer for 5 more minutes. Sprinkle chopped cilantro(Coriander leaves) , mix well and remove from the heat. This Thai Red Curry goes well with hot steaming rice. Very good, just Add Ketchup to taste. Is the chili powder I buy for making chili the same as the chili powder needed for this recipe?? If not can thai chili paste be substituted? Yes you may use Chili paste , but I normally use simple red chili powder we get in grocery stores. Can we use a lite can of coconut milk ? What kind of curry powder? The Indian kind? Or is there a different kind a a different kind? No the curry powder is the one which you normally get in any grocery store. It isn't Indian one. This sounds amazing! Do you think this could be made in a slow cooker? Never tried in slow cooker. But I guess it should work. Good to hear that you liked it Jeanie. G'day Pooja... as a visitor from Australia it is such a joy to find a great selection of wonderful Thai recipes and you have made it all so easy to follow step by step. An excellent presentation as I just love the videos and photos, so yes please sign me up for new posts! And thank you for sharing! Absolutely delicious meal.I made a cup of Jasmine rice and poured the cooked rice in the pot with the rest of the recipe. Will be making this again. Thank you so much for this recipe! It's the best one I've found for chicken curry. I've made it several times- I love how easy it is and it's so delicious! Great recipe! I made this with some rice noodles and enjoyed it. I found I needed to add salt and more curry to our liking, Thanks for a nice base recipe - I will make it again with different vegetables and some crispy tofu! I made this last night and it was delicious! Thank you for sharing this! This is excellent and very easy to make!! Much better than the curry I get at my local Thai restaurant! is this a spicy (hot) dish?